Blackadder T-Shirt Stickiest Situation Since. 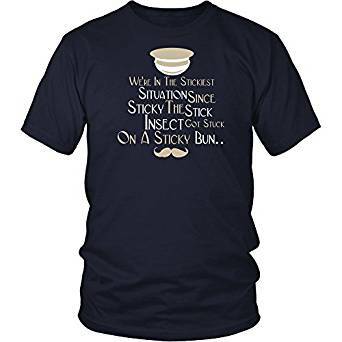 A T-Shirt inspired by the classic Blackadder line- We’re in the stickiest situation since Sticky the Stick Insect got stuck on a sticky bun. This Blackadder T-Shirt is inspired by the line – We’re in the stickiest situation since Sticky the Stick insect got stuck on a sticky bun. Available to buy through Amazon UK.